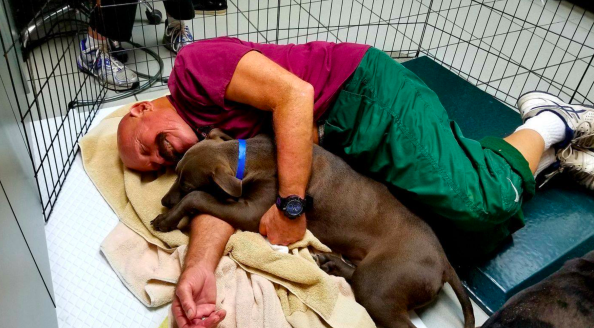 When shelter dogs leave the operating room at the Humane Society of Tampa Bay, where they have been spayed or neutered, the retired Hillsborough County deputy waist them to comfort and cuddle them in a recovery pen during a scary time. Honig says that it is actually soothing to him and he enjoys the amazing experience. He volunteers at the Tampa shelter ten hours a week. She says that it makes her emotional when she even thinks about it, as it is just moving to see volunteers coming to their shelter just to try and make things better.